Oh the burn! There is nothing like a lung-burning race through the snowy forest. 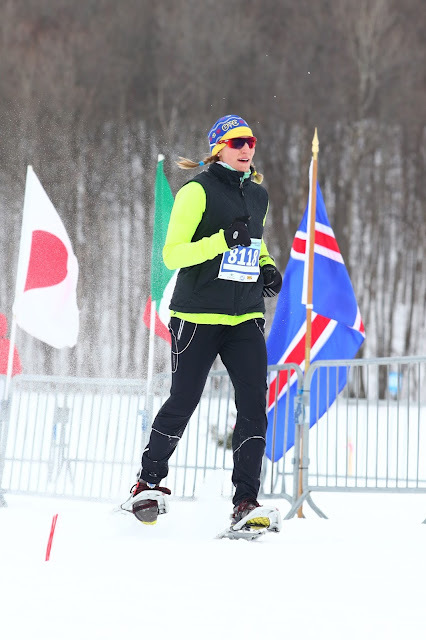 Or at least that is what I discovered last Sunday at the Gatineau Loppet 5k Snowshoe Race. 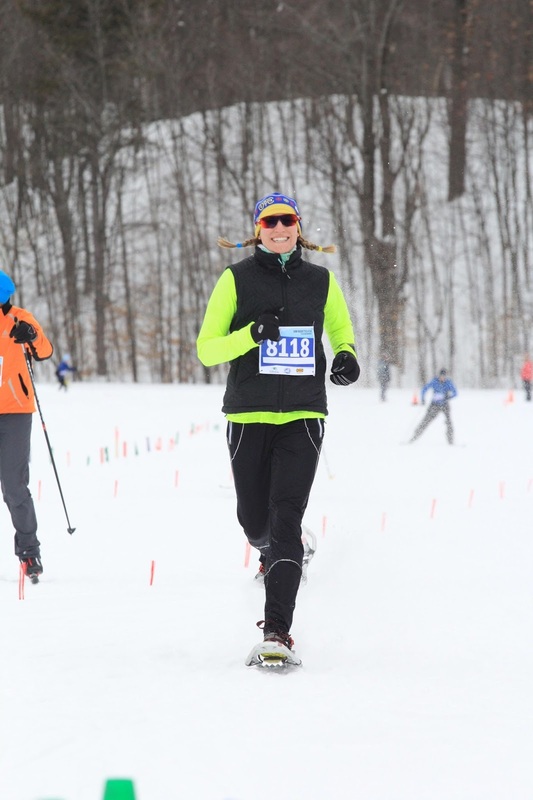 Wow, snowshoe running is so much fun!! 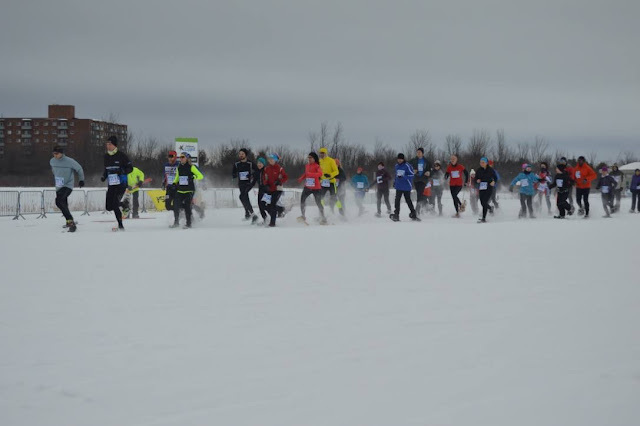 We started the race as a mass start, with the 50 or so racers for all 3 distances beginning together. The first bit of the race was in a large, open field as we made our way to the trails of Gatineau Park. It was fast and flat, and my strategy was to get out in front. I imagine that I started way too fast (I was scared to look at my watch, so I just didn't look at it at all until I felt the buzz indicating that I had completed a mile), but I wanted to ensure that I didn't have to try to pass people on the trails. 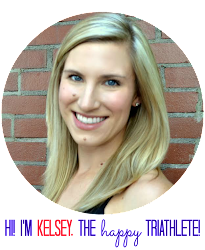 It seemed that being able to run my race at my own pace would work the best. As we rounded the bend to enter the woods, a volunteer told me that I was, "la première femme." Yes! I had to laugh because the man behind me shouted that he was, "the second woman." He was a great source of motivation in the woods, not only to stay ahead of him for as long as possible, but also because we chatted a few times to help motivate each other. Thanks Joe! Once in the woods, I tried my best to keep up the pace on the uphills and to fly as fast as possible on the downhills and flats. There were a few really steep hills that I walked, and was very thankful for the crampons on my snowshoes. The course flew by, and the same trails that I had covered in a pre-race scout on Thursday night, seemed to pass by in no time. I was in fact running a lot faster than in the scout run though, as that first mile indicated. My pace surprised me quite a bit, particularly after several months running below aerobic threshold in my training. That said, my lungs were on fire the whole time! It was also an absolutely perfect day with gorgeous conditions. The trail was well groomed and it was beautiful and quite peaceful to be in the woods. It was quite cold, but I had overdressed and actually started to overheat by the end. As we exited the woods, I was so thankful to discover that the race was actually only 4k. While I certainly could have done that extra kilometer, it would have been challenging. 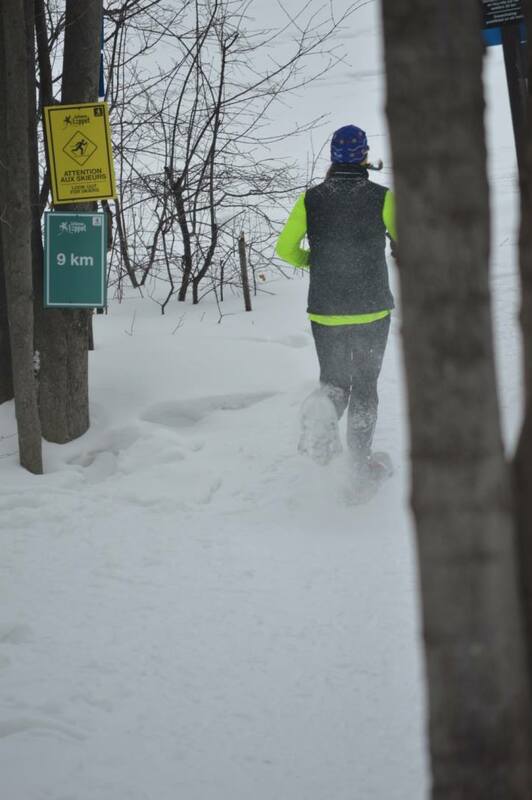 On the home stretch, I happened to glance behind me and saw Amanda's pink toque as she turned out of the woods. So I put pedal to the metal, despite knowing that I could probably hold her off to the finish. This was a super fun race and a great, new challenge. I will definitely be doing more snowshoe racing next winter, and hopefully spend some time on those trails this summer getting muddy. Now, I can confidently cross another item off my "30 before 30" list! 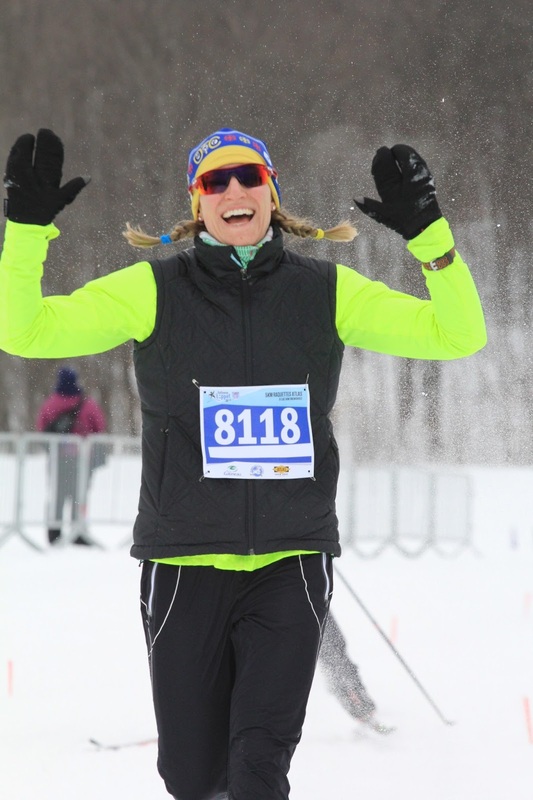 Thank you so much to the Loppet organizers and volunteers! This was a stellar event, and I'll be back next year (though perhaps I will ski next year! ).